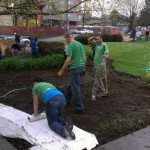 Every April, Starbucks coordinates lots of volunteering projects in communities all across the United States, and internationally as well. Anyone can join in. 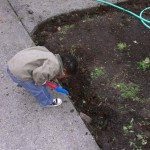 Last year, I signed up for a tree planting project in Cle Elum. This year I picked two projects that looked interesting and that I could work around my work week. 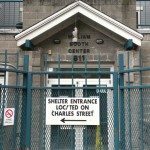 The first was Friday, April 18, 2014, and was a meal program at the William Booth Center (a shelter and meal program for homeless men). 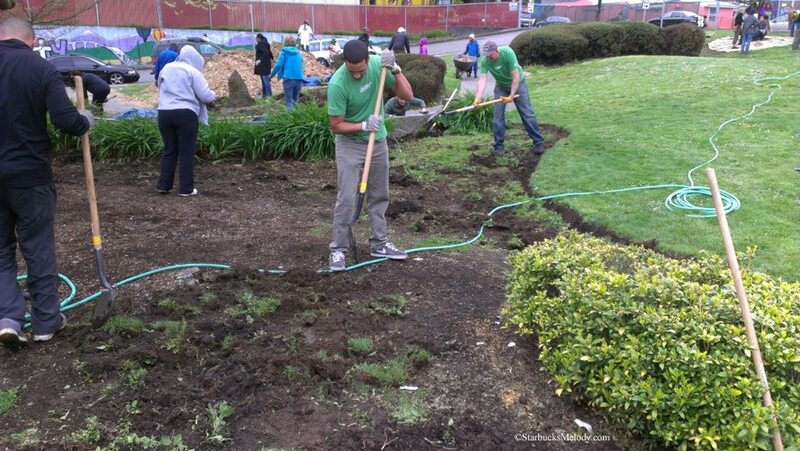 The second project was a middle school beautification project on Saturday the 19th. I had such a great time at both! 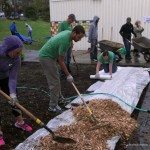 If you haven’t signed up for a community service project, there’s still time. Here’s the official Starbucks Community Service website. 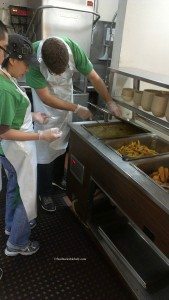 On the 18th, I met up with three partners to serve food at the William Booth Center. It turns out, they were all part of Starbucks finance (in various roles). Janey, Jake, and Christian told me that they come back once a month to serve food, all year long. I walked to the William Booth Center from my office, and got to work right away. Christian and I wiped down the tables and put out the salt and pepper. Janey and Jake started making some sandwiches to serve a small number of sack meals for those individuals who for one reason or another couldn’t make it to the hot lunch meal that we’d be serving. After cleaning the tables, I joined in with the sack lunch project: I added a banana, granola bar, a bag of chips, and a can of juice to the sack lunches to get them ready to distribute. This was a super fun short volunteering project. Meryl, an older gentleman who seemed to be in charge of the kitchen, was very thankful that there was someone there to stand serving food for an hour. 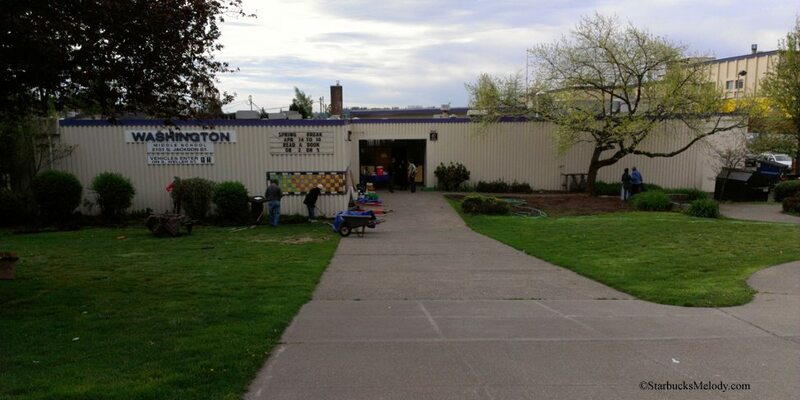 On the 19th, I went to Washington Middle School for a “beautification” project. I didn’t have a clue what I’d be doing but I was game. I met up with numerous Starbucks partners who were already familiar faces. I worked on a team with store manager Gypsy, assistant store manager Kienan, and partners Laurel, and Kiesha. 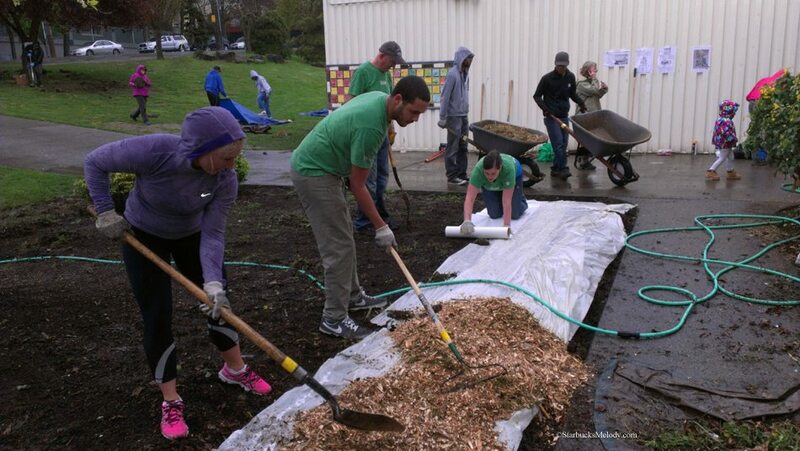 We had to dig a trough around an area to be mulched, clean the area of most of the weeds, lay down paper, and then spread mulch over the paper. Easier said than done! From there, we split off into groups. There were other groups working in other areas, but my photos will just be from the team that I worked on. But I know that the school appreciated everyone who came out! 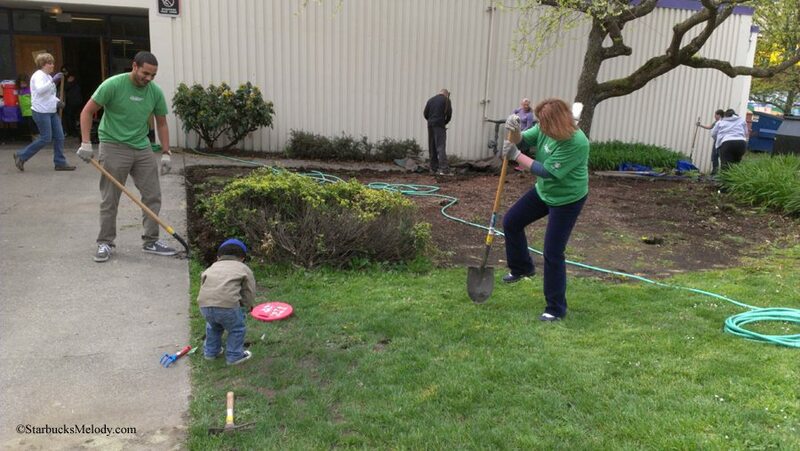 I learned that that there are too few gardeners for the number of schools that they’re responsible for maintaining. 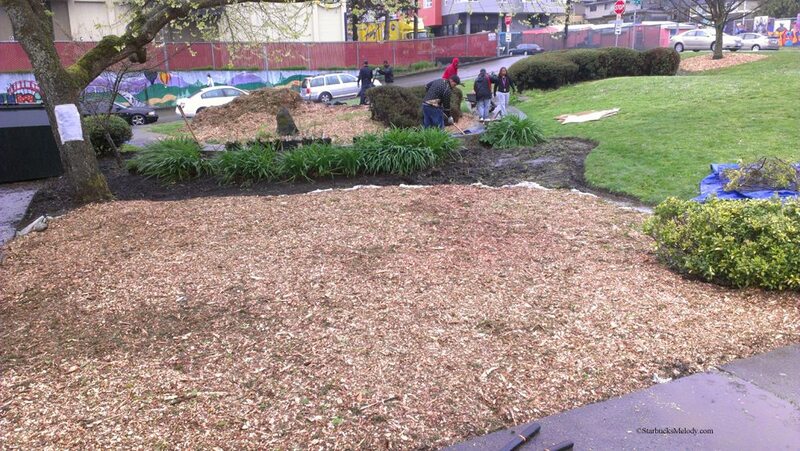 First thing we did was dig a trough around the area to be mulched. I asked a person standing nearby to get an action pic of us working. Here I am with Kienan, and Adam (the little boy) working on troughs. Adam, the little child, was the son of one of the volunteers. 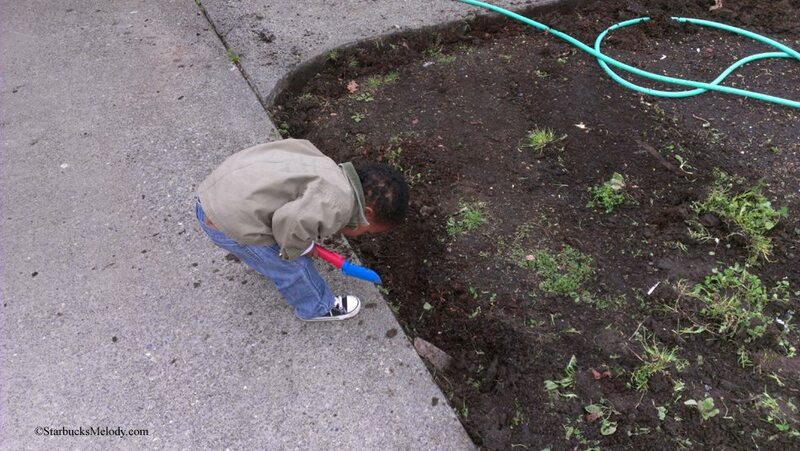 He seemed to really like helping out with the trough digging. It was just adorable watching him trying to help us! Starbucks partner Ain Powell coordinated and put together this project (working in partnership with the school district) and I think (I sure hope I have this right) that Adam is Ain’s son. 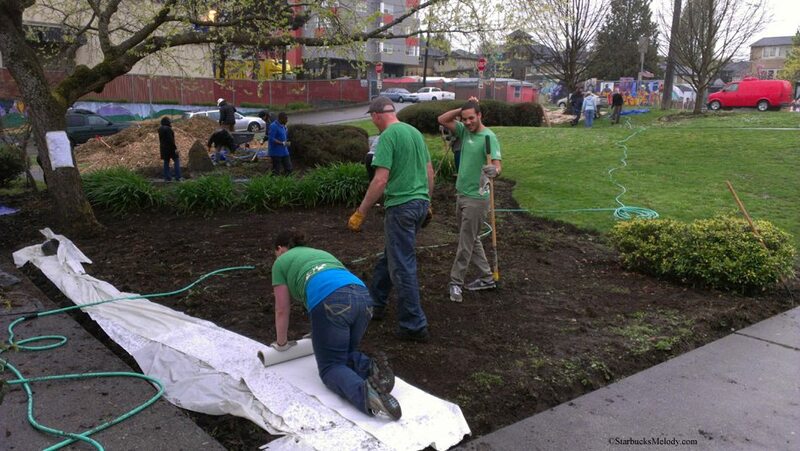 After preparing the lawn with a trough, we placed a layer of paper on the open area. It might not be obvious in this photo, be we got rained on pretty heavily doing this. I got down on my hands and knees and helped roll out the paper. I ended up soaked with muddy clothes, and loving it. A separate team that worked with the mulch (hauling it around the grounds in wheelbarrows) brought us mulch to cover our area of the grounds. Partner Keisha and I (to be clear, if you don’t know it already, I’m not a partner) rolled out paper, and partners Kienan and Gypsy then shoveled mulch over the paper. When we were done, it looked great! We ended the morning with a group photo of all the volunteers. Thank you to everyone who came out. This was a fantastic project! I know that the school employees were extremely appreciative. 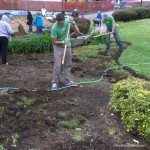 They explained that they just don’t have the resources to hire more gardeners and they’d really wanted to beautify the front grounds of the school. 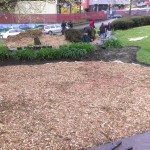 It does look great mulched. "Do You Want a Frappuccino?" (From the mailbag). When I first moved to Seattle, I did so blindly and with no money…. 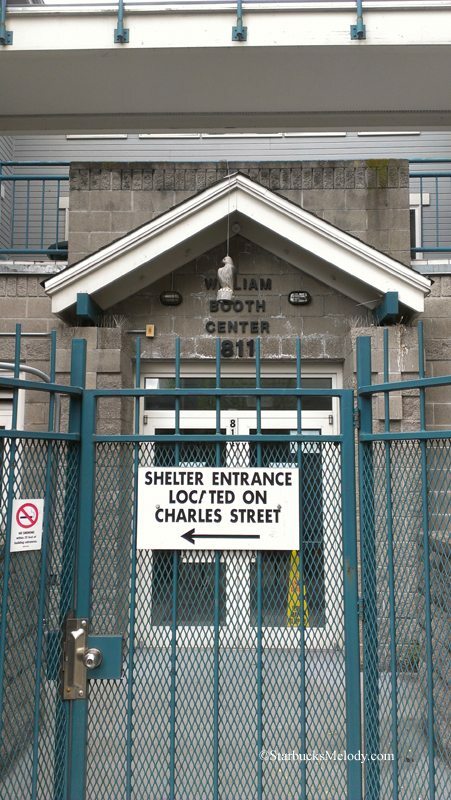 and the William booth center was my first home for my first month here. Thank you do much for the love! 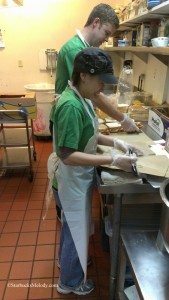 I’m now working at Microsoft and continue to volume at FareStart year round to cook and serve meals at various shelters. Launce thank you for that comment! I’m glad that they were there for you! When we met at Pacific Place, I would have never guessed that you stayed there for a month. Melody nice to hear about your volunteer projects. I know about the website to volunteer but it is sort of sad that the projects offered around here are not posted on the store bulletin board. I really think each store and district has their own policy about posting. I have volunteered at soup kitchens and it is quite gratifying. Thank you also for sharing the pics. @Purple1 – Meal programs are indeed gratifying! I don’t think the bulletin boards are the main way that Starbucks gets people involved. It’s the community service website. I literally sat down one night and just browsed through projects and ultimately picked two that looked fun to do and worked around my work schedule. I also sort of did want back to back projects because it makes it easy to write about for a blog post. Great article! 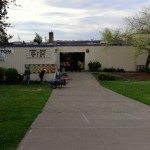 I loved being a part of the Washington middle school project. Watching the kids help at the school they attend (or will in about a decade in Adam’s case) was great. 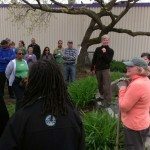 Many of the volunteers and coordinators knew each other outside of Starbucks because they attended that school and grew up together in the neighborhood. 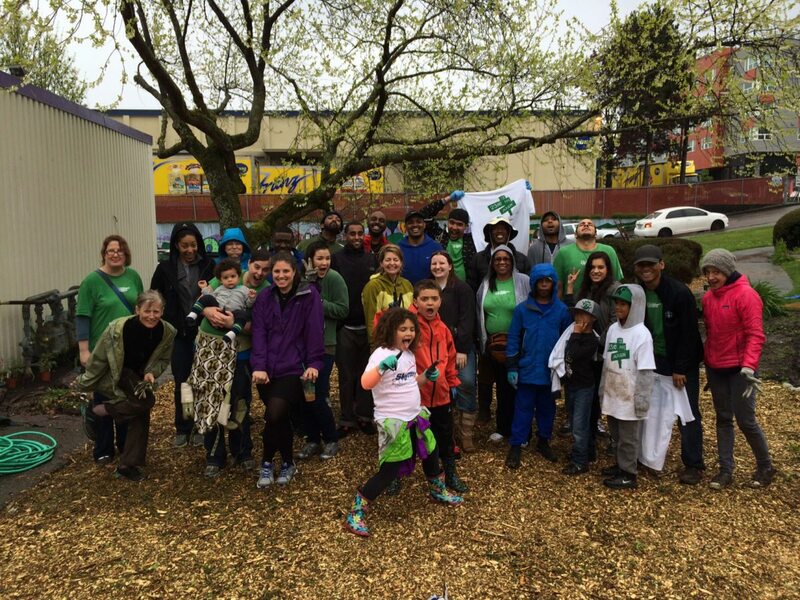 Bringing together the local community to impact several generations of friends and neighbors is amazing. 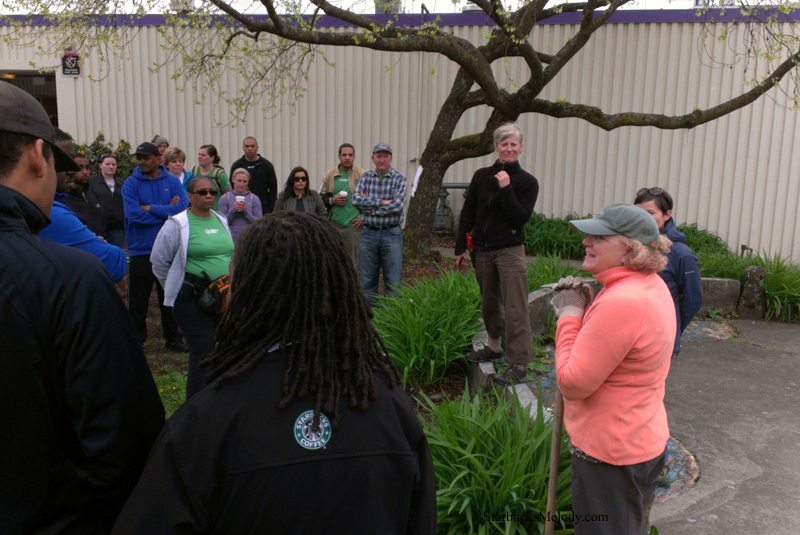 And I know you missed it, but when part of the group met at the community store (23rd and Jackson) one of the coordinators said, ‘You know it’s a good idea when you realize you should have done it a long time ago.’ I can’t remember who said it, but it definitely resonated. Also, it was great to finally meet you in person! @MagicKat – It was awesome meeting you in person too! Thank you for signing up for this event. I was a little sad that I missed the 9:30 coffee event. Since I only signed up through the website, I was unaware of what else was going on with this event. Nonetheless, I had a blast. And my heart melted watching the kids try to help! Adam was so adorable! Melody. Thanks so much for volunteering with us. It was great to hear your perspectives on Starbucks and many other social issues–very refreshing–like an ice cold caramel macchiato?